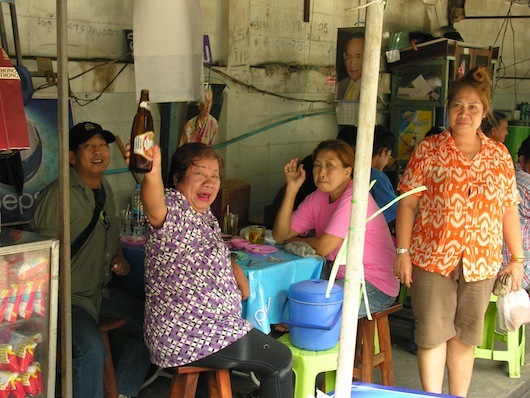 Bangkok doesn’t give up its secrets too easily, but for those willing to look deeper, the traditional flute making village of Baan Lao on the west side of the Chao Phraya river in Thonburi offers a taste of some “real” Thai culture away from the tourists. 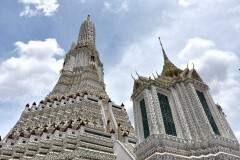 It also happens to make a worthy side trip from nearby Wat Arun, and while flute making might sound a tad boring, Baan Lao is far from a stuffy crafts museum. 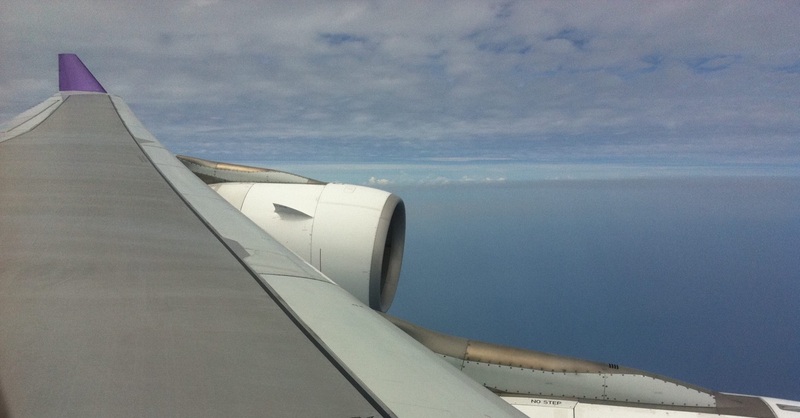 In fact, it’s a living example of a tradition that’s continued at this exact spot for more than a century. Don’t worry, admission is free. The friendly craftspeople of Baan Lao are quick to welcome visitors into their modest workshops to have a peek at — and a listen to — their unique craft. One of three flute masters currently residing at Baan Lao, Khun Sunai, who goes by the nickname of P’Chang (big brother elephant in English) invited us into his workshop/home. 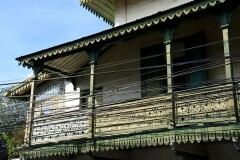 His father, grandfather, and great grandfather were all renowned flute players and flute makers who resided in the very house where P’Chang carries on their legacy today. P’Chang testing out a flute. 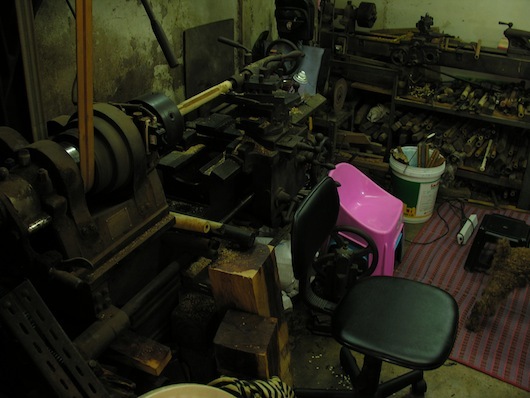 With a couple of yipping dogs and random relics scattered about in the one-room open-fronted shophouse down a small alley, P’Chang’s workshop has a distinctly humble atmosphere, which at the same time carries an air of mystique. Faded photos of P’Chang’s late flute master father on a shelf add some unintentional authenticity. 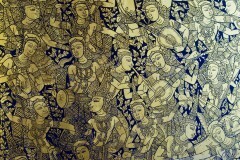 Although the bamboo flutes produced here are literally an instrumental aspect of traditional Thai music, the flutes — like the people who craft them at Baan Lao — are of Lao descent. 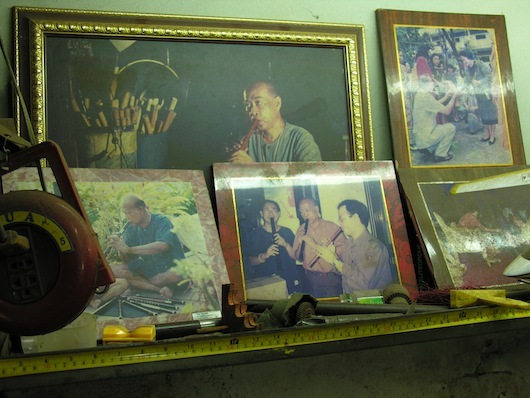 It’s said that a group of Lao flute specialists migrated from Vientiane to this exact place in Thonburi during the late 1800s, set up shop producing their particularly fine flutes, and have continued to do so for more than five generations. 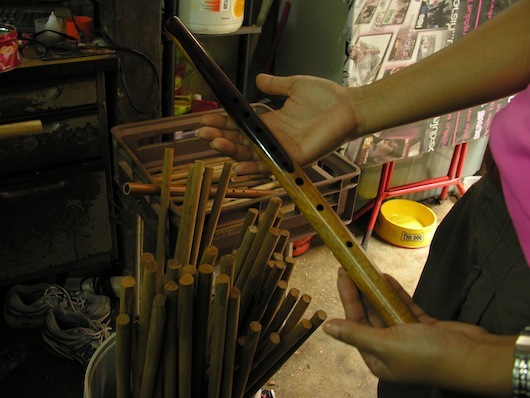 Crafting a flute takes several weeks, and although the village now produces plastic flutes as well, the far better sounding bamboo versions are created the same way they would have been centuries ago. After being carefully selected for strength, the bamboo is first dried in the sun before being cut to the desired length. A long, round piece of wood is then inserted within the hollow middle of the dried bamboo for several days so as to balance the fibres, a step that’s pivotal for producing optimal tones. The bamboo is then polished using bricks wrapped in coconut husks. Melted lead or other substances — such as mother of pearl — are sometimes added for decoration. They don’t make flute cutting machines like they used to. Once this extensive work has been completed, the all-important step of carving eight finger holes in what will be the front of the flute, one in the back for air passage, and a tiny slit for the mouthpiece at the top is carried out. This step must be done by a focused master craftsperson; one slight wrong move could render the piece ruined. If played by a master, it sounds as good as it looks. Flutes are made in various sizes — large pieces of bamboo will produce low-toned flutes while small pieces will produce high tones, and traditionally low, medium, and high toned flutes are played together in melodic accompaniment. Producing the perfect tones in correlation to the carving of the finger holes is solely up to the trained ears of masters. In the old days in Laos, fine flutes played by master musicians were believed to cure the sick, and to put the spirits of the recently passed at ease. 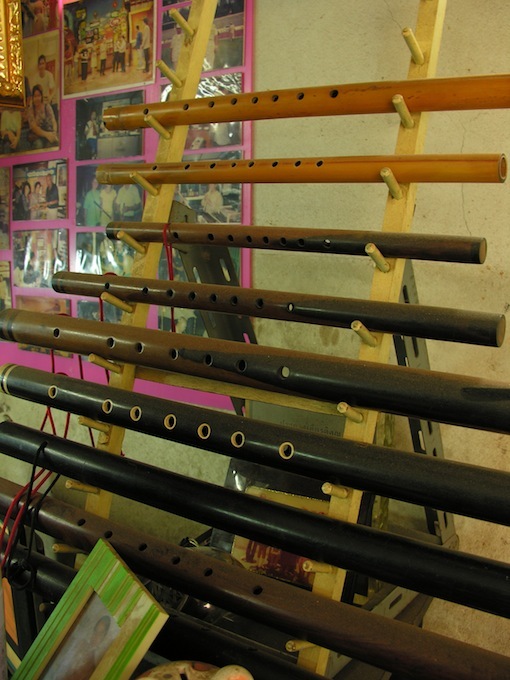 Baan Lao is very much an out-of-the-way attraction, but even if you’re not interested in flutes or traditional Thai-Lao music, it’s still worth the effort to get here simply for the experience of being invited into the home of a traditional flute maker. 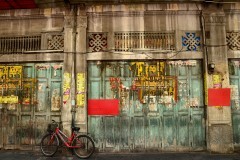 In fact, everyone and everything found on this little side street and its nearby network of alleys makes for an altogether memorable glimpse of old school Bangkok life. 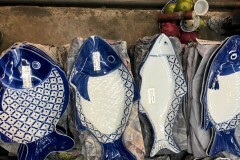 Charming, in a Bangkok kind of way. 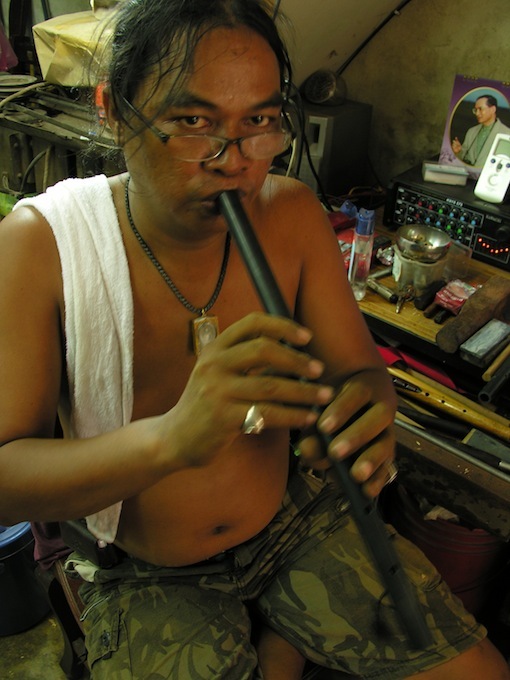 Along with his wife, son and neighbours, P’Chang can be found most days working on varying flutes, or sharing in an impromptu music session with local flute players who happen to pass by. 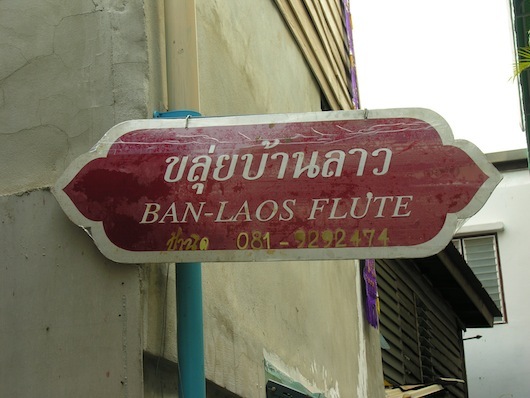 Especially during late afternoon, the soft harmony of the masters’ flutes gently resonates from down the tiny alley of Baan Lao. 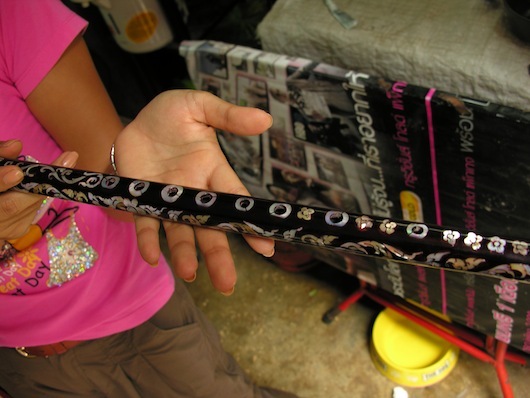 There’s no pressure put on visitors to buy something, but should you want to try your hand at the Lao flute, plastic pipes go for between 50 and 150 baht, and larger bamboo versions run 5,000, with more elaborate designs going up from there. Feel free to explore the alleyways, just don’t fall in a canal. 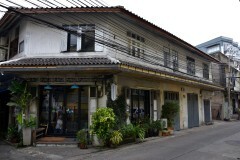 Baan Lao is located down Itsaraphap Soi 15 near Bansomdet Rajabhat University in the heart of Thonburi. 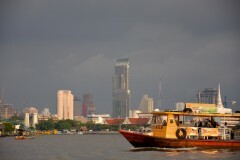 Itsaraphap is a main thoroughfare running north to south through Thonburi, and the beginning of Soi 15 is on the west side of the road. 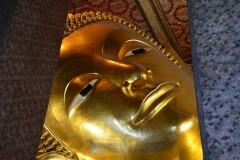 Make sure to turn left when the soi turns sharply that way rather than keeping straight and entering the temple gates. 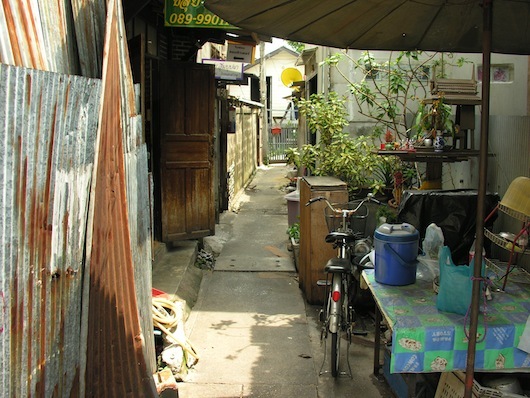 P’Chang’s workshop is set down a narrow alley towards the end of the soi. A somewhat hidden brown sign with some information in English marks the entrance. You could take a taxi (tell the driver "itsaraphap sip-haa / baan lao"), or walk the 1.5 kilometres from either Wat Arun or Wongwian Yai BTS station.